London: "The Star" Publications Department, 1935. Includes tipped in signatures of Len Hutton and J. Keir to front pastedown. Cocked, lightly rubbed and bumped to corners/edges, closed edges heavily foxed, slightly sprung with odd cracks to binding within, first few pages lightly foxed, small ink inscrip. to f-fep, else internally clean and tidy, plates bright.. 1st. Cloth. Good Minus/No Jacket. 12mo. LONDON: THE STAR PUBLICATIONS DEPT. VG. 1935. 1ST. SOME SUN DAMAGE AND SLIGHT WEAR TO EXTREMITIES, SOME SPOTTING ON FFEP AND EDGE OF PAGES . London: ''The Star'' Publications Department. Fine. 1935. First Edition. Hardcover. Original light green cloth, gilt lettering, very clean and bright. Internally, neat name and address to front end paper, clean and sound with a tight binding. No foxing. Octavo, 320pp, frontis and other illustrations. Book # 5845c; 12mo 7" - 7½" tall . The Star, 1935. Hardcover. Very Good. 1935. First Edition. 320 pages. No dust jacket. Green cloth. Book is in better condition than most examples of this age. Neat, clean, well bound pages with very minimal foxing, tanning and thumbing. Small inscriptions and neat labels may be present. Boards have mild shelf wear with light rubbing and corner bumping. Some light marking and sunning. London: "The Star" Publications Department. 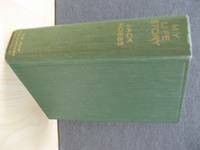 320 pages, illustrated, appendix, index, foxing to page edges, otherwise very good condition in green cloth with gilt spine lettering. . Very Good. Hardcover. First Edition. 1935. London: "The Star" Publications Department, 1935. Hardcover in acceptable condition. No jacket. Minor edge wear on hardcover. Page block and pages are lightly marked and foxed. Tears on rear pastedown hinge but binding remains intact. Previous owner's name penned on FEP. Volume is cocked. Contents are clear throughout. HCW. Hardcover. Acceptable/No Dust Jacket. Used.